Milton and Marlo are a brother and sister who have died in a fluke mall marshmallow bear accident after which they are sent to Heck, a place where “bad” kids go to await judgment. While Marlo is proud of her devilish pranks, Milton is an innocent straight-A student who believes he was sent to Heck by mistake. 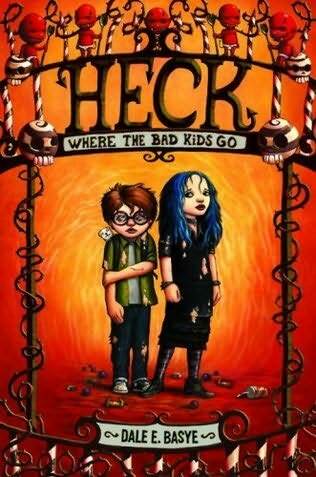 Now the two kids try to find a way out of Heck and the evil clutches of its director, Bea “Elsa” Bubb. It’s not that I don’t get these jokes; it’s that I already heard them, or variations of them. There are only so many times you can reword well-known phrases and still be funny. This happens a lot, actually, not just in books. And I’d like to use this opportunity to say it’s never amusing to use other people’s phrases, even if you twist them or try to make them ironic. Here’s an example of one particularly annoying phrase that is reworked repeatedly. We are all familiar with the Milk ad campaign: “got Milk?” For some reason, people still think it’s funny to reuse that phrase even though the ad campaign is Ten Years Old. I’ve seen billboards that say “got Jesus?” There are ads for cleaning services that say “got Mildew?” Please, please, think before you re-use a phrase in an attempt to be witty. It’s not clever; it’s definitely not funny, it’s totally unoriginal, and it borders on plagiarism. Anyway, if these kinds of things are funny to you, you will love this book. If you’re looking for more original humor, try Louis Sachar, Roald Dahl, or Richard Peck. These writers offer humor with humanity; you will laugh and think and feel something. I didn’t do any of those things reading Heck. I recommend this book for 8 year old boys who think farts and snot are funny.